A delicious, mind-blowing cook-off is about to happen in the historic streets of Pilsen this weekend. So it is best you come prepared with an empty belly. Beginning May 27th through 29th, the Eighteenth Street Development Corporation (ESDC)’s seventh annual Mole de Mayo Festival will delight festival goers in the art of mole. What was once a one-day festival has grown into a three-day fest where mole enthusiasts can enjoy in an array mole. The festival is set on 18th St. and Ashland Ave. The focus of the Mole de Mayo festival will be the mole competition where local restaurants will battle for one of two honors: Mole de Mayo Best Mole Award determined by a panel of judges and the People’s Choice Award decided by festival attendees. Lawndale Bilingual Newspaper asked ESDC’s Executive Director Alex Esparza about what makes a great mole sauce and what people can expect at this year’s festival. 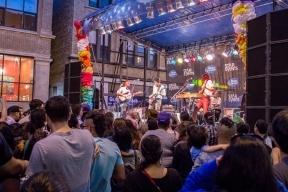 Lawndale Bilingual Newspaper: Mole de Mayo is one of the best and most beloved festivals in Chicago, what kind of preparation goes into this type of festival each year? Alex Esparza: It’s about bringing the right ingredients together just like “mole sauce” to create something special that everyone would enjoy. Typically preparation takes about 6 to 8 months of careful planning and organizing. We focus on the smallest detail to ensure that our visitors have the best time possible, but we also look to create a festival of value, distinction, and purpose. In the first year, this festival was a one-day event, now it is three days! What does that growth signify to you? Now in its 7th year, the annual festival has grown to become a music, art, and culinary festival drawing thousands of people from Chicago to the suburbs. This growth is a result of hard work and dedication from the organization, volunteers and the community. It makes us happy to continue delivering an event that people want to attend year after year. Everyone has their own version of cooking mole, what to you makes the best tasting mole? There is no such thing as the best “mole”. From a family generation recipe to restaurants, they all have their own take on a recipe. 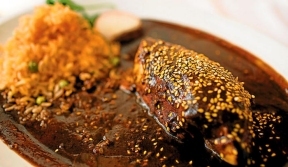 “Mole sauce” is made with different flavors, types, colors and even textures. “Mole” is like art. 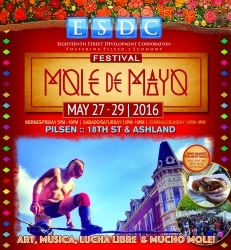 As the event nears, what would you like everyone to know about Mole de Mayo festival? We invite you to come and enjoy this family-friendly event with us. Everyone has to check out the ever-popular, “Lucha Libre” (masked wrestlers), bring the kids to the “Plaza de los Niños” (kids zone), and discover some unique items from artisans and merchants available for purchase. The festival hours are from 5p.m., to 10p.m., on Friday, May 27th; Noon to 10p.m, on Saturday, May 28th; and Noon to 9p.m, on Sunday, May 29th. Suggested donation is $5 individuals and $10 for families. For more information, visit www.moledemayo.org.